Why did the world relate to the Notre-Dame fire? How many of us around the world felt the pain of watching flames engulf Notre-Dame cathedral in Paris? How many of us were taken aback by the spontaneous tears we couldn’t help shedding regardless of religious allegiances? As an atheist, the fall of the spire felt like a punch in the stomach. Then again, I’m French and we tend to experience anything that hurts our cultural heritage as personal. When Yellow Vest protestors ransacked the Arc de Triomphe in December 2018, there was a national public outcry. My father, the son of a Polish immigrant to France, was incandescent with rage. “How dare they? !” he kept saying, unable to parse why anyone would destroy that which belongs to all, not to mention desecrate the memory of fallen soldiers. In France, culture is our shared wealth, our shared pride, and an intrinsic part of our national identity. Promoting it and preserving it is a duty the French government takes seriously through its Ministry of Culture, which is dedicated to the arts and cultural legacy in all its forms. 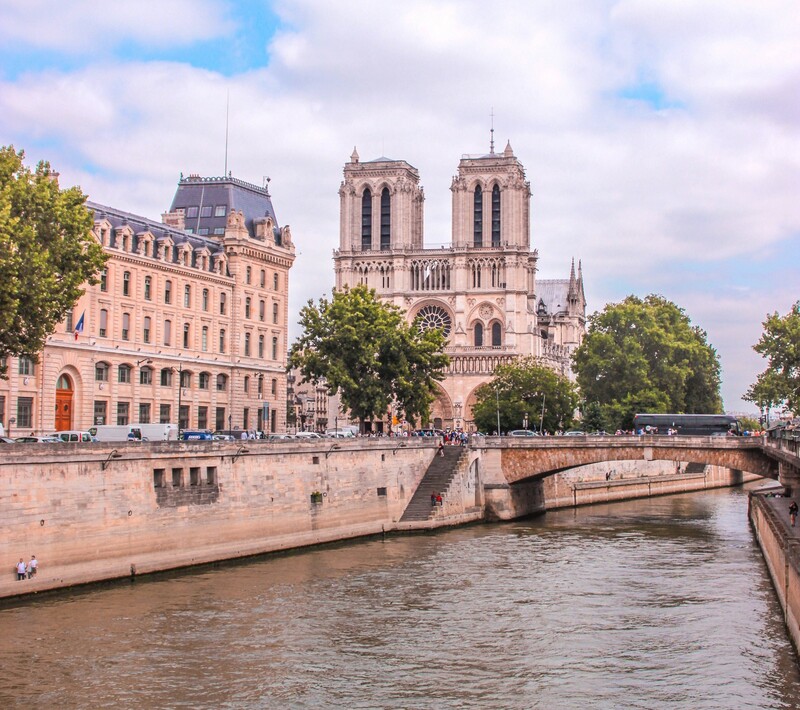 French culture is also what draws millions of visitors from around the world to Paris every year, some of whom I took to Notre-Dame as an educational tour director. Not a single one of them ever turned on their heels, unimpressed. It is impossible to stand in front of Notre-Dame and not be in awe. No matter what god you worship — if any — the cathedral is an enduring testament to human prowess. It is also a powerful reminder of what we can achieve when we come together and align vision and dedication with an ethos of service. Notre-Dame is so much more than a French or Christian symbol. It is a monument that transcends religion and national identity and has stood as a proud tribute to humanity since the Middle Ages. Wherever we are in the world, it belongs to us all as members of the human species, much like the Coliseum in Rome or the pyramids of Egypt. Faith isn’t the sole preserve of devout people; not subscribing to the existence of any god doesn’t stop atheists from seeking the divine in one another. My faith is an unwavering belief in the innate goodness of the human animal and in our potential. While it is often put to the test by capitalism and individualism, the kindness and selflessness of strangers restores it just as often. While some of us draw strength from worshipping deities, it doesn’t mean that those of us who do not have neither morals nor ethics. Instead, we place our faith in our fellow humans; we choose to hold ourselves accountable for everything and harness the power of agency. It’s one of many ways to live, neither superior nor lesser than subscribing to an established religion. We humans are ingenuity, hope, and faith made tangible. It was humans like you and I who built Notre-Dame with their bare hands as an expression of love, gratitude, and pride as they rallied around a common cause. Often described by the French as a treasure, Notre-Dame is open to all, for free, and you needn’t be a Christian to appreciate its intricate beauty, just a human. Like the fire that destroyed the National Museum of Brazil in 2018, the one in Notre-Dame is a human tragedy, another landmark reduced to ashes. It’s not just a building that burnt down but part of human memory. For what is history but an attempt to remember who we are as a species, where we come from, and what we are capable of? Yesterday the Paris skyline changed forever and France died a little. But the human spirit is always stronger than flames and destruction, we are resilient, we are resourceful, and we are builders. We will rebuild Notre-Dame for future generations, and it will be an international effort. Because our shared humanness knows no border and has no religion.